I do not even know where to start, except to say that my main focus is you as a dad. You are a dad now. My brother, this is not an easy journey, but it can be completely rewarding and fulfilling. I know we stress about the future, but what I want to tell you is while you are figuring out schools and sports and building blocks for characteristics that we want to share, focus on the Muvaki who is here now. We blink and they are sitting. We blink and they are crawling. We blink and they are running. Don’t blink for too long in these days that we have here and now. Focus on changing diapers as often as you can. Focus on feeding and bathing as much as you can. You are not a helper in this process, you are a co- parent. Never expect any thanks from anyone- including your partner for doing what you are meant to do. To say that you have achieved something in having a child is not correct. You know me better. Any man and woman can copulate and procreate. Your test is here now. You survived pregnancy, and now our baby is here in the physical. Muvaki is crying and needing a bath. He needs a cuddle and he needs to be burped. Now. This is where we will see you achieve your destiny as a dad. I have no doubt in my mind that you will be a great dad- mostly because you have a fantastic role model, you will not drop the ball. You are a father now, a dad and I look forward to seeing you grow and be present in this role. It is so important for you to know that you are raising a young man of the future. One who will grow to respect people- women and men alike. It is not pressure, because it is who you are already as a person and you just need to be conscious about leading by example. Muvaki is a boy and that does not mean he cannot cry, or show emotion. Just like you do, he will. I am so certain that he will be the man that you are in the future. I want you to know that you have every skill to take on this new title, and to absolutely rock at it. You are your mother and fathers son and they didn’t raise anything but an extraordinary man who has given them a grandson to love as much as they have loved us. They raised a smart, confident, humble, respectful, gentle, mature, generous, kind, incredibly intelligent man, and you will do the same. I want to thank you Kudzi, for always being such a great brother. For allowing me to be the full older sister that I am and always knowing that I love you and will protect you fiercly- as you do me. I want to thank you for being who you are. 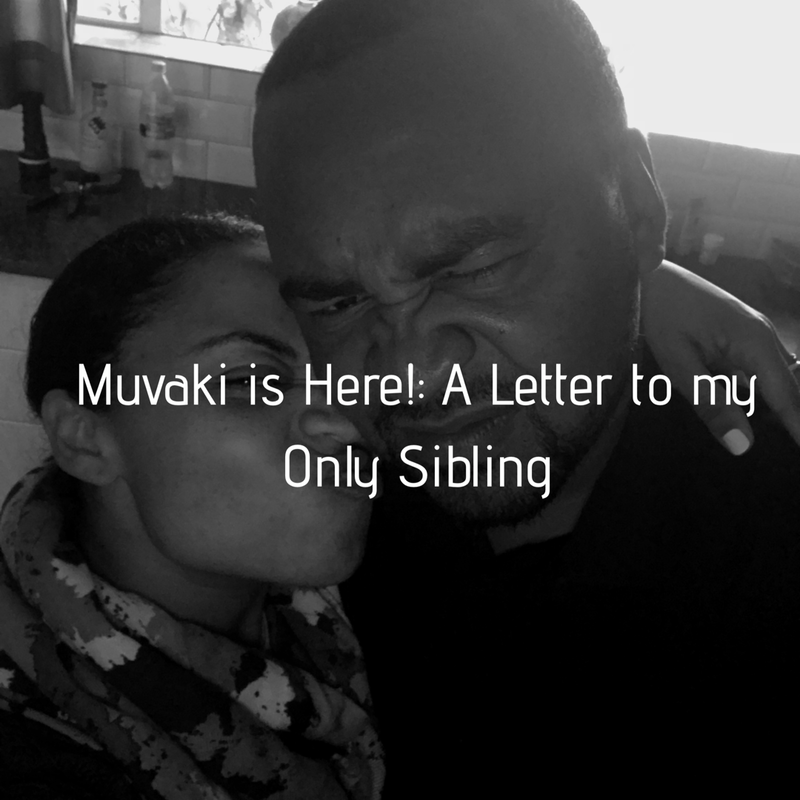 When you told me of Muvaki’s names, I was not surprised, for you are such a deeply spiritual being and your son’s names are reflective of that. I also completely agree. I look forward to seeing all that Muvaki builds, including you as a father. I have cried for weeks thanks to the birth of my nephew. I have cried because even though I have been Tete to many, this time, I am Tete to my only siblings son. I am Tete to the son of the one I share everything with, including blood. You are the best dad already. I am in awe of you. I am always proud of you. Maita Shava! Mhofu yomukono! Ziwewera! Hekani Mutekedza, vakatekedzana paJanga, vakapiwa vakadzi munyika yavaNjanja! Hekani Mutekedza, vari uHera Mukonde! *Tete- In Zimbabwean, Shona cultures, the sister of one’s father.